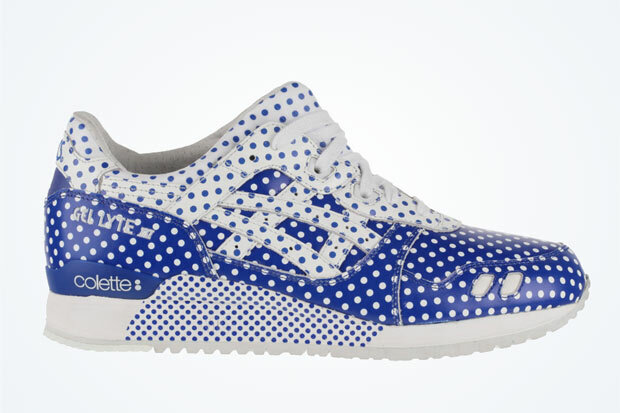 Will You Be Copping The Colette x Asics Gel Lyte 3 “Dotty?" Another Asics collab will be hitting retailers very soon! Continuing to celebrate the 25th anniversary of the Asics Gel Lyte 3 silhouette, Asics has teamed up with Colette to bring us this very Polka Dot rendition of the sneaker. The Colette x Asics Gel Lyte 3 “Dotty" is the next collaboration set to release, and we can't wait. The Colette x Asics Gel Lyte 3 “Dotty" is inspired by the Parisan retailer's aesthetic and heritage shown throughout their stores. The entire sneaker is made up of only two colors - blue and white. Although the sneaker only features a two-toned color scheme, the sneaker's appearance is nothing short of dope. Covered in nothing but Polka dots, the Colette x Asics Gel Lyte 3 “Dotty" is finished off with 3M accents to liven things up. If you're digging the Colette x Asics Gel Lyte 3 “Dotty" you can catch the sneaker at select retailers June 27th.